In the early aughts, I dated and eventually married a huge Takeshi Kitano fan. Of this relationship came some good things, and I rank my children and exposure to some really good cinema the highest (in that order, for those of you wondering). Among the good cinema was a plethora of Kitano films. Brother was seen on a date. Ditto Kikujiro (pizza and a Japanese movie inspired by The Wizard of Oz. Good times.). 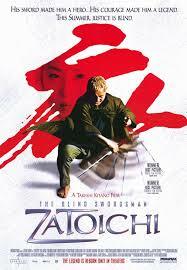 The best, though, was going to see Zatoichi when it was playing in the theatres. You can rent this one on Amazon. Here’s five reasons to cough up three bucks and watch it this weekend. You know how there are some people in this world that just exude cool? Like, walk into a room, totally own it and yet you’re still mildly terrified that this person has the ability to obliterate you? That’s Takeshi Kitano for me (my ex would argue Chow Yun-Fat). He’s great to watch. Even if you’ve only ever seen Battle Royale, you can quickly understand that this man owns scenes. That he wrote the screenplay and directed the film makes it even better. The man’s an incredible storyteller in multiple facets. For those of you that have never heard of the character before reading this (no judgment here – everyone’s got to start somewhere), this character has been around for a long time. With 26 films and a television series under its belt, this one’s a bit of the Doctor Who of Japanese swordmaster dramas (minus the whole regeneration, but retaining the maximum cool and badass-ness). Plot in ten words or less: swordsman shakes down yakuza corruption in small town. Sometimes, the simple plots are the best (ya listening, Shyamalan?). There’s an air of whodunnit throughout this one that keeps you guessing as to the true crime lord. It also manages to say some amazing things about poverty and child prostitution, as well as gender identity. It’s well-executed. Thumbs up here. I am a sucker for a good action sequence. Sometimes, I go for ridiculous. Other times, I go for believable. These are just fun to watch. You know when they’re coming. You’re on the edge of your seat. They’re a blast. Yes, you read that correctly. Seriously, watch this if only for the huge tap dancing number. There is a lovely shot in there in particular that makes me grin like a loon every time I see it. Pure beauty. Nice. 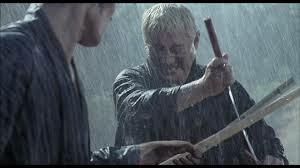 Bonus points for the Blind Fury/Rutger Hauer pull. Edit: because words are hard.